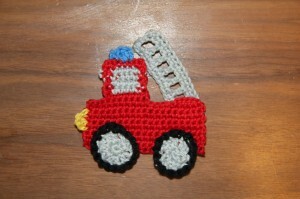 This fire truck applique is done quickly and easy. Yarn: Nizza Steinbach Wolle, 100% cotton, inred, silver, blue, yellow and black. End the last stitch in red with a loop of silver, keep both colours running on the backside of your work and crochet the sc around both threads, so they wont be visible and you wont have to weave in so many ends. 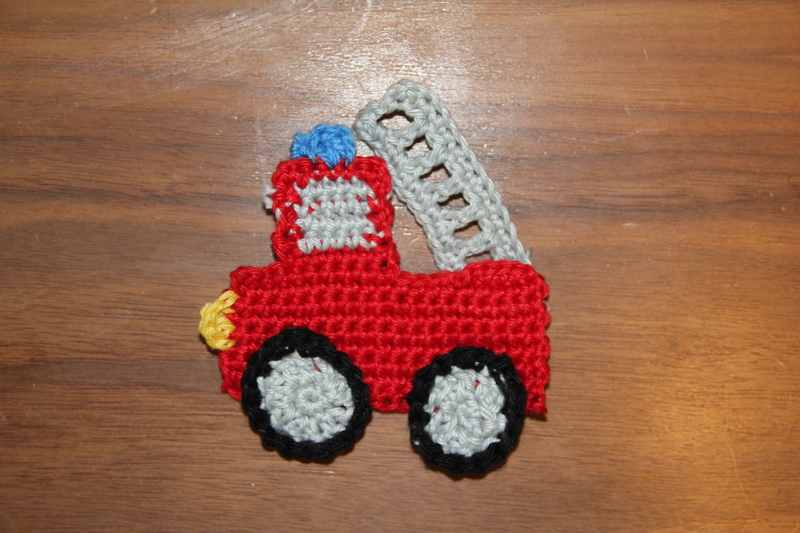 Backside of the truck: draw a loop, 4 sc, ss, end the work, weave in the ends. fasten off, leave a long tail to sew the wheels on the truck. 3. ch1, 1 sc in dc of the prev round, 1 sc in hole between dc’s, last sc in 3rd ch of prev round. 2. 1 sc, 3 dc in one stitch, 1 sc, fasten off. weave in the ends. 1. draw a loop in 3rd sc on the upper end of the truck. 2. 3 dc in one stitch, ss in next stitch, fasten off, weave in the ends. Sew the ladder onto the truck. Sew the wheels onto the truck.